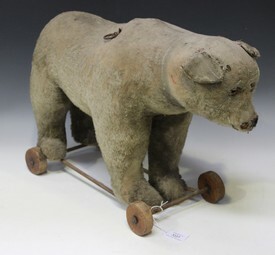 A mohair growler pull-along bear, probably Steiff, with amber and black eyes and vertically stitched snout, mounted on a metal chassis with wooden wheels, overall length approx 57cm (playwear and repairs). 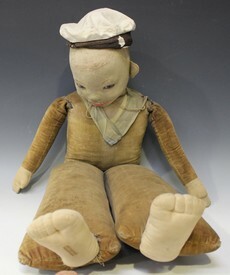 A Norah Wellings soft toy sailor doll with blue eyes and painted features, height approx 76cm, and two similar small sailor dolls (playwear and colour has faded). 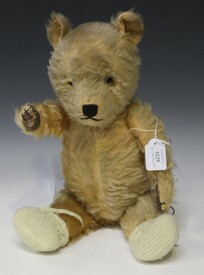 A mid-20th Century mohair teddy bear with amber and black eyes, vertically stitched snout and claws, and jointed body with rexine pads, height approx 52cm (some bald patches and playwear). 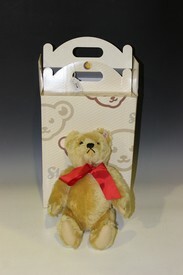 A modern Steiff mohair replica teddy bear 'Teddy Boy' with gilt button and tab in left ear, black eyes, vertically stitched snout and claws, and jointed body with felt pads, height approx 50cm, with certificate. 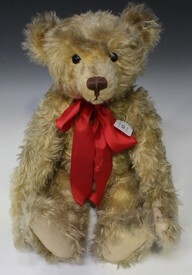 A modern Steiff Classic mohair teddy bear with gilt button and tab in left ear, black eyes, vertically stitched nose and claws, and jointed body with felt pads, height approx 50cm. 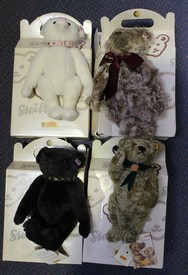 A modern Steiff mohair growler teddy bear with gilt button and tab in left ear, black and white eyes, vertically stitched snout and claws, and jointed body with felt pads, height approx 40cm, and a modern Steiff 'Raffles Bear' with black eyes, vertically stitched snout and claws, and jointed body with felt pads, height approx 42cm, both with certificates. 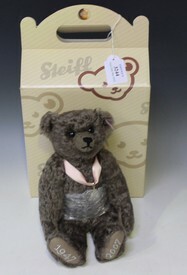 A modern Steiff growler teddy bear with gilt button and tab in left ear, amber and black eyes, vertically stitched snout and jointed body with felt pads, height approx 43cm, together with a Steiff teddy bear 'Asian Happiness', with certificate, and a Steiff Brummbär teddy bear. 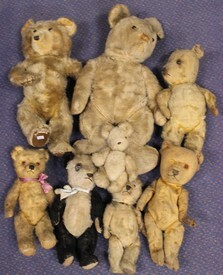 A mid-20th Century mohair teddy bear with amber and black eyes, stitched snout and claws, and jointed body with rexine pads, height approx 44cm, together with six other teddy bears and a panda bear (playwear, bald patches and faults). 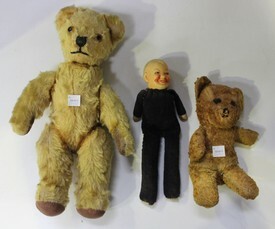 A mid-20th Century mohair teddy bear with a bell in each ear, amber and black eyes, stitched snout and jointed body with fabric pads, height approx 33cm, together with another teddy bear and a fabric doll with resin head. 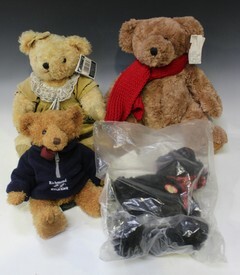 A modern Steiff 1959-2009 black mohair teddy bear with gilt button and tab in left ear, amber and black eyes, stitched snout and jointed body, height approx 36cm, sealed in a bag with instruction booklet, together with three other teddy bears. 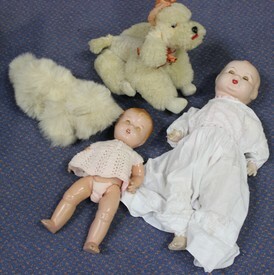 A Merrythought soft toy cat, a musical soft toy poodle and two dolls. 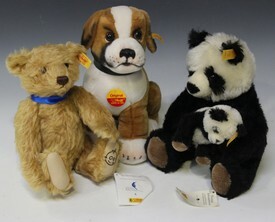 A modern Steiff mohair 'The Peter Pan Centenary Bear' with gilt button and tab in left ear, amber and black eyes, stitched snout and claws, and jointed body with fabric pads, with attached label and medal, height approx 28cm, together with a modern Steiff seated dog, a panda bear and cub and a drawstring bag. 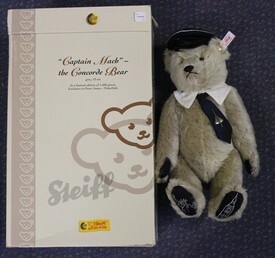 A modern Steiff 'Captain Mack the Concorde Bear' with boot button eyes, vertically stitched snout and jointed body with blue felt pads, wearing a blue peaked cap, collar and tie, with Concorde badge, height approx 33cm, boxed, with certificate. 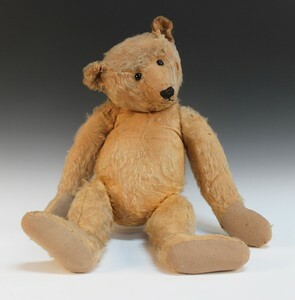 A mohair wood straw filled hump back growler teddy bear, possibly Steiff, with black glass boot button eyes, vertically stitched snout and four claws to each limb, and jointed body with fabric pads, height approx 74cm (bald patches, wear holes, repairs and some claw stitching missing). 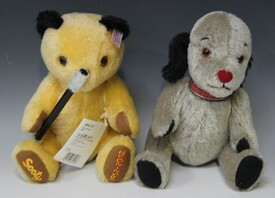 A modern Steiff soft toy Sooty and another of Sweep, both boxed, with certificates. 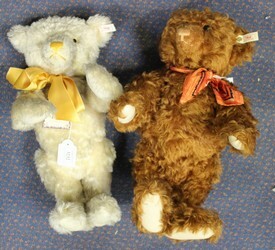 A modern Steiff growler mohair 'Queen Elizabeth II Coronation' teddy bear with gilt button and tab in left ear, amber and black eyes, vertically stitched nose and jointed body with fabric pads, with crown and robe, height approx 30cm, together with a 'Diamond Jubilee' teddy bear, a 'Royal Diamond Wedding Bear', a 'William and Catherine The Royal Wedding' teddy bear, a 'William' teddy bear, a 'George' teddy bear and a 'Catherine', all boxed, with certificates, together with a Danbury Mint 'The Royal Baby Christening Doll Prince George', boxed. 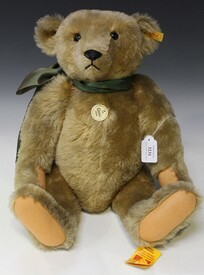 A modern Steiff limited edition 'Black Bear of the Year 1914' with gilt button and tab in left ear, amber and black eyes, vertically stitched snout and jointed body with fabric pads, with gilded medal, height approx 31cm, together with a 'The Growler Bear', a 'The 2013 Steiff Bear' and a 'The RHS Chelsea Flower Show Centenary Bear', all boxed, with certificates. 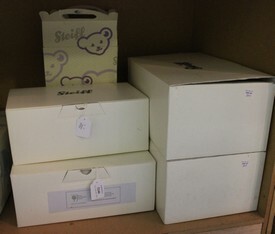 A modern Steiff '50th Anniversary Bear' with gilt button and tab in left ear, amber and black eyes, vertically stitched snout and jointed body with fabric pads, height approx 35cm, together with a 'Children in Need Bear' and a 'Krystal Bear', all boxed, with certificates. 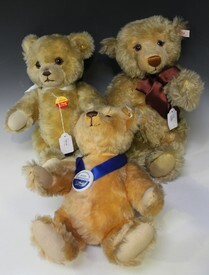 A modern Steiff 'Million Hugs Bear' with gilt button and tab in left ear, amber and black eyes, vertically stitched nose and jointed body with fabric pads, height approx 28cm, together with a Steiff 'Scouts Bear', a 'Jill' bear and a 'Friends for Life Bear'. 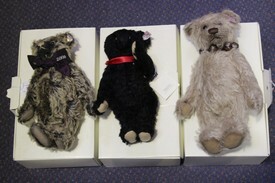 A modern Steiff 'Titanic Centenary Bear' with gilt button and tab in left ear, amber and black eyes, vertically stitched snout and jointed body with fabric pads, with gilt medal, height approx 27cm, together with a 'Margaret Bear' and a 'Bojangles Bear', all boxed, with certificates, and a book '100 Years Steiff Teddy Bears' by Günther Pfeiffer.